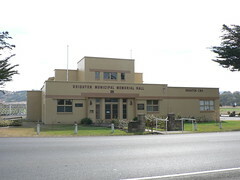 Brighton Municipal Memorial Hall is Tasmania. At first I thought the building was a really lovely pavilion, so popular in swimming suburbs like Cronulla or Bondi. But now I am not clear what a municipal memorial hall is - not the suburb's town hall? I couldn't find much information about it. I suspect it is a community hall rather than a Town Hall.